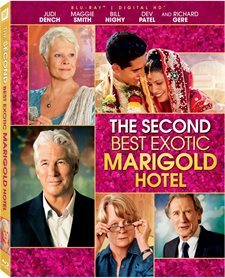 Download The Second Best Exotic Marigold Hotel in Digital HD from the iTunes store. The Second Best Exotic Marigold Hotel images are © Fox Searchlight Pictures. All Rights Reserved. I know the saying is "third time's a charm", but, for Fox Searchlight, it seems to be the second go around is charming, or at least just as charming, as the first. 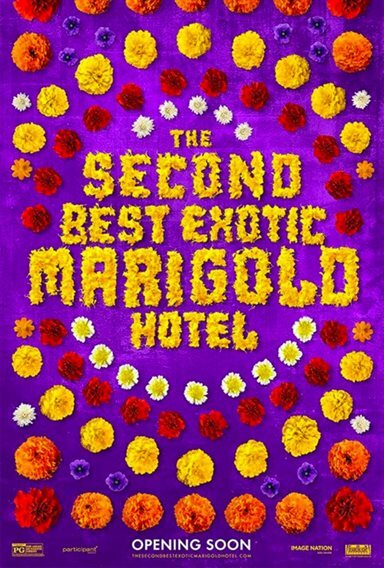 The surprise hit of 2012 is back, along with the entire cast, for The Second Best Exotic Marigold Hotel. Starring some of Britain's most talented actors, this is one sequel that is just about as good as the first movie. As with all good business ventures, companies are always looking to expand and find the right investors. This is where we find Sonny (Dev Patel; Slumdog Millionaire) and Muriel (Maggie Smith; Harry Potter and the Deathly Hallows) at the start of the film. The best exotic marigold hotel has been up and running for 8 months and they head to California to seek investors to finance their second hotel in India and, at the same time, Sonny is planning his wedding to Sunaina (Tina Desai; Sense8). When the investors tell Sonny they will send someone to visit their hotel, he assumes it is the handsome American, Guy Chambers (Richard Gere; Pretty Woman). Trying to impress Chambers, Sonny becomes unbearable to be around. Add in the fact that he loses the building for the second hotel to another contractor, and he sees his world unraveling. Meanwhile, the inhabitants of the original hotel are having issues of their own. Evelyn (Judi Dench; Skyfall) is trying to determine if she should engage in a relationship with Douglas (Bill Nighy; Pirates of the Caribbean: At World's End) while she accepts a full time job with the company for which she works. Madge (Celia Imrie; Bridget Jones' Diary) is torn between her two suitors, both of whom want to marry her. Finally, Norman (Ronald Pickup; Prince of Persia) thinks he may have accidentally taken out a "hit" on his girlfriend Carol (Diana Hardcastle; Doctors). One of the draws of this film is the fantastic cast. With a veritable who's who of British acting royalty, there is not a moment where you aren't in awe of their acting skills. Adding Richard Gere to this group was inspired and he blends in beautifully. The other draw is the setting. India is a feast of colors and sounds and delicacies that bombard the senses from every direction. Had this film been shot in another country, I doubt it would have had the same impact, feel, and culture. Of course, the setting is enhanced by the 1080p video quality which helps to make India even more stunning. The visuals on this Blu-ray are truly breathtaking at points. The DTS-HD Master Audio 5.1 allows you to hear all the highs and lows in the music and is pretty much what you would expect. The Blu-ray extras include featurettes about the story, the cast, the hotel, romance, the wedding, and India. All are very informative and worthy of their 3 minute running times. They add some cute behind the scenes moments and insights without being overbearing. Taking on the task of trying to live up to the first hit film couldn't have been easy for writer Ol Parker (Now Is Good) but he does a great job of intertwining the story lines while keeping everything fresh and interesting. At no point does the movie drag and sensitive subjects are dealt with in a thoughtful manner.